John Tyler was the 10th President of the United States who served in office from April 4, 1841 to March 4, 1845. What was the life of John Tyler like? The short biography of President John Tyler covers important information and facts about his early life, his family, career and the famous events and achievements of his political life. Our short biography of John Tyler provides an interesting and easy way to learn about the life of the President. The following important facts provide a fast overview of important facts about President John Tyler. Facts and Info: John Tyler was the 10th president of America who assumed the office of president after the death of his predecessor William Harrison. His most notable accomplishment was making Florida part of the union. He is also remembered for his approval of the annexation of Texas. For additional info refer to 20 Facts about John Tyler. Facts and Info: John Tyler was born March 29, 1790 in Charles City County, Virginia. He was born to a wealthy, aristocratic Virginia family and raised on a plantation. He rose to prominence in the early years of the newly established nation. He died on January 18, 1862 in Richmond, Virginia. John Tyler was the great-uncle of president Harry S Truman. Facts and Info: The career of John Tyler included the roles of Lawyer, Politician and Statesman. He received an excellent education and graduated from the William and Mary College. He became the 10th president of America in 1841 and served for 4 years until 1845. He was playing marbles when informed that he had become president. Facts and Info: John Tyler was married twice. His first wife was Letitia Christian with whom he had 8 children. His second wife was Julia Gardiner who he married just under a year after his first wife’s death and with whom he had 7 children. Both of his wives lived during his presidency and both performed the duties of the First Lady. Tyler's second wife, Julia Gardiner Tyler, initiated the practice of playing "Hail to the Chief" whenever a president appears in public. John Tyler was the first president to marry whilst in office. Facts and Info: John Tyler belonged to the Whig Political Party. The Whig political party operated from the early 1830s to the mid-1850s in opposition to the Democratic Party and favored a program of modernization and economic protectionism. He was 51 years old when he was inaugurated as the 10th president. Five years after leaving office, John Tyler was so poor that he was unable to pay a bill for $1.25 until he had sold his corn crop. For additional facts refer to his Presidential Cabinet members. Short Biography of John Tyler: What he was like! Facts and Info: John Tyler was just over 6 feet in height with a very thin build. He had fine wavy brown hair, blue eyes, a large nose and a prominent forehead. He had a likeable, dignified man who possessed both charm and grace. He was an accomplished musician and enjoyed playing the violin. Facts and Info: During his lifetime he played a key role in important events of the era. The Second Seminole War, also known as the Florida War, was a conflict in Florida between various groups of Native Americans, collectively known as Seminoles, ended in 1842. Florida was admitted to the Union just after the conflict. In 1845 the U.S. annexed Texas by the joint resolution of Congress. Tyler claimed that he had evidence that the British intended to seize the unstable territory from Mexico and he played upon fears that should the British control Texas, they would outlaw slavery, damaging the southern economy. The Webster-Ashburton Treaty with Britain was signed and resolved several border issues between the United States and the British North American colonies. 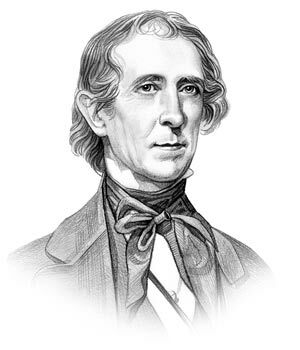 John Tyler lived in retirement in Virginia until the outbreak of the Civil War in 1861 when he returned to Washington as chairman of a peace convention. He died a year later. Facts and Info: During his life John Tyler suffered from various health problems which included symmetric paralysis, dysentery, frequent colds and a stroke. Dysentery was fairly common in the 1800's. It is usually caused by bacteria found in bad drinking water. Facts and Info: John Tyler died during the Civil War of a bilious fever & respiratory failure. He died on January 18, 1862 in his rooms at the Exchange Hotel in Richmond, Virginia. He was buried on January 21, 1862, in Hollywood Cemetery. The short biography of John Tyler provides a fast overview of the key facts and events about his life and the accomplishments of his presidential term in office. The following John Tyler video enables you to sit back and listen to the history of his personal and political life - a useful educational resource for kids, children and schools learning about the life of President John Tyler.